We’d love your help. 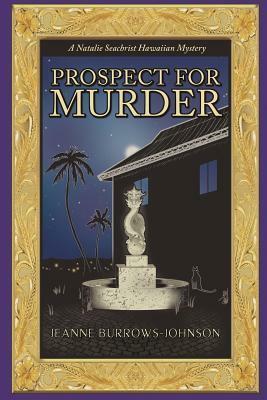 Let us know what’s wrong with this preview of Prospect for Murder by Jeanne Burrows-Johnson. Retired travel writer Natalie Seachrist has had visions since childhood. But the sight of a girl's lifeless body draped over a vintage Mustang shatters her personal world when she learns her vision has been prescient. The horrible truth is that her twin's granddaughter Ariel is dead! While the Honolulu Police Department conducts its customary investigation, Natalie decides Retired travel writer Natalie Seachrist has had visions since childhood. But the sight of a girl's lifeless body draped over a vintage Mustang shatters her personal world when she learns her vision has been prescient. The horrible truth is that her twin's granddaughter Ariel is dead! While the Honolulu Police Department conducts its customary investigation, Natalie decides to move into the Makiki apartment complex where her grandniece died. Aided by her friend Keoni Hewitt, a retired police detective, and her fleet-footed feline companion Miss Una, Natalie begins her very personal on-site sleuthing. To ask other readers questions about Prospect for Murder, please sign up. My original Prospect for Murder audiobook review and many others can be found at Audiobook Reviewer. 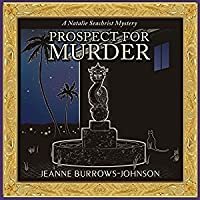 Prospect for Murder by Jeanne Burrows-Johnson is a well written cozy mystery peppered with historical references that are enlightening and engaging. A young woman seeking a place to live visits an apartment complex only to be found dead, lying on top of a vintage vehicle. Her grand-aunt steps in to solve the mystery. The deadly fun begins as Natalie, the grand-aunt, moves into the very apartment My original Prospect for Murder audiobook review and many others can be found at Audiobook Reviewer. Prospect for Murder by Jeanne Burrows-Johnson is a well written cozy mystery peppered with historical references that are enlightening and engaging. A young woman seeking a place to live visits an apartment complex only to be found dead, lying on top of a vintage vehicle. Her grand-aunt steps in to solve the mystery. The deadly fun begins as Natalie, the grand-aunt, moves into the very apartment her grandniece fell from; guided by interviews of the tenants and her uncanny visions, Natalie delves deeper into the mystery. Methodically moving from tenant to tenant, exploring and researching Natalie makes a horrifying discovery. Taking place in Hawaii, Burrows-Johnson masterfully describes the locations, people and history in vivid detail that flows almost poetically. Although it is a slow-moving cozy mystery, it is captivating. The story moves slowly as it is filled with Hawaiian and Shanghai history focusing around the WW2. Methodical and detailed, Burrows-Johnson reveals each clue until the last clue of the killer is revealed. Furthermore, her character development and back story is well-developed also. This allowed for me to connect to the characters and wish to see justice done. I enjoyed the retired copy, Keoni and Natalie together, and how they danced around their relationship. The supernatural piece was well written into the story. This is a very enjoyable book. If you enjoy cozy mysteries, this is a perfect book for you. I enjoyed it immensely. The book does center around an older woman so don't expect any death-defying rumble tumbles. The lack of emotion Natalie displays was a bit odd but in looking back, I find myself detached from emotional moments as well. It is a bit predictable, at one point I wanted to scream - am I the only one who sees what is going to happen? But this was excusable as the book overall was very interesting and entertaining and educational - I had no clue of the history of Hawaii. The narrator, also the author, Jeanne Burrows-Johnson did an excellent job of reading the book. The enunciation and clearness of her speech as well as the passion was not over the top or fake; she not owned the book as an author but as the narrator as well. Her voice was soothing and calming. There were no issues with the audio production or quality of this audiobook. The means for executing good barbecue is something a true man of the Islands is seldom without - plus a supply of beer and a macho vehicle. At this point, Natalie, let's dispense with formalities. Please call me John, and I'll call you Miss Marple. Don't give me that 'I'm just fine' routine. Be a good retired cop and go quietly with the guys with the stethoscopes. Being a resident of Hawaii, I could not pass up a murder mystery based in Honolulu. It was thrilling while at the same time oddly relaxing to read a story with so many local references to places, food, culture, and traits. I was quickly drawn into the narrative and enjoyed being in Natalie's head as she processed information and formulated her plans. The writing was insightful, observant, emotive, and intelligent. Each scene, task, and event was highly detailed and meticulously described - she really was a close approximation or the Hawaiian version of Jessica Fletcher, as her friend had teased. I savored the sense of familiarity as well as the intriguing storyline. This one is kind of set up like Jessica Fletcher takes Hawaii, where Natalie Seachrist is the retired writer who constantly gets embroiled in a murder case. While I didn’t really feel the connection to Jessica Fletcher until it was mentioned, I do see the similarities between these two main characters. Both are writers who, as this first book illustrates, tend to stick their noses into others’ fishy business. Still, this story felt much darker than any Murder She Wrote ever has; not that that’s a bad thing but it doesn’t match the mood I’ve come to know from the television series. With Natalie’s memories of visiting war-torn countries on assignments, the gruesomely detailed death around which the main mystery revolves, and just the number of deaths in total – unrelated to the current crime but this family has been wiped out! – it was escaping that “cozy” feeling for me. I will say, a minor disappointment for me was that the big reveal wasn’t at the 90% mark of the book. I’ve seen so many Murder She Wrote episodes that I’ve come to time them, and Jessica always confronts the killer with exactly 10 minutes left in the episode 😛 But hey, Natalie’s got a different system! She also has a twist that Jessica doesn’t have to use to her advantage. Natalie has visions, often of things that have passed, and a strong bond with her brother who has a similar gift. I was quite surprised by this, as I was expecting a more traditional mystery. It felt awkward at first but as the story warms up, this strange addition to the genre actually fits in rather well. The detail of this book was part of what brought my rating down. The writing overall felt very formal. Every aspect of Natalie’s day was spelled out, from showering to putting on makeup, and even every item she had to eat that day. This detail really wasn’t needed for the story and it made it feel more like a journal entry than a narrative. Some of these things can just be imagined by the reader so we didn’t need it explicitly stated. Burrows-Johnson's cozy mystery Prospect for Murder is set in the Hawai'ian Islands, proving that even Paradise has its dark side. We begin with the odd occurrence of our protagonist having a psychic vision. Both she and her brother have unique gifts, different yet complementary. Sadly, Natalie's vision is one of gruesome death, one with personal ties to Natalie herself. The victim is her niece, who’s fallen from the fourth storey of an apartment building where she had gone to look at a possible rental. The death is first considered accidental, possibly suicidal. Natalie doesn't buy this, and using the skills of a researcher, and the gifts of a psychic, she sets out to prove murder, or at the least, a true motive for the death. She finds suspects in the landlady who was going to let the apartment, Natalie's mysterious roommate, who had not shown to view the place, and the maintenance man for the complex (her niece fell on his priceless, customised car). During all of this, she is also doing historical research for a friend named Keoni. I am picky about reading cozy mysteries. It's a bias about the word 'cozy’, which makes it seem to me that the story would be trivial. This has never actually been the case, and I am really glad that I gave this story a chance. I live in CA, and have a hope to one day visit Hawai'i. I enjoyed reading about Natalie's research work as much as the murder plot. The story is well-written, though there were a few places where pacing slowed down a bit. Natalie reminds me somewhat of Fletcher, from Murder She Wrote, with a bit of the X-Files added thanks to the psychic thread. However, she also reminded me a great deal of my forensic anthropology professor, and that's the person Natalie 'looked like' to me as I read. I'd love to read more of Natalie's adventures in the future! Author Jeanne Burrows-Johnson sets out a daunting task for herself as she opens her new Natalie Seachrist series of mystery novels with Prospect for Murder (2016). In her notes, Burrows-Johnson says “I look forward to introducing historical characters and incidents with in the genre of a mystery novel.” I view this as daunting because most mystery readers have a pretty clear idea of what they want from a mystery novel, and they are not always happy if they don’t find what they expect in the firs Author Jeanne Burrows-Johnson sets out a daunting task for herself as she opens her new Natalie Seachrist series of mystery novels with Prospect for Murder (2016). In her notes, Burrows-Johnson says “I look forward to introducing historical characters and incidents with in the genre of a mystery novel.” I view this as daunting because most mystery readers have a pretty clear idea of what they want from a mystery novel, and they are not always happy if they don’t find what they expect in the first pages. Maybe they look for a Miss Marple-like polite and subdued British mystery heavy on clues, a police procedural with an abundance of forensic evidence, the private eye or noir mystery, or maybe they are looking for an action-packed hero like Jack Reacher who encounters constant danger on almost every page. The historical mystery is a genre of its own. However it is unusual to attempt to bring historical events into a contemporary setting, and still maintain that mystery aura. Burrows-Johnson introduces us to semi-retired writer and researcher Natalie Seachrist, resident of Hawaii, who is unhappily thrust into a close-to-home mystery as she investigates the suspicious death of her great-niece, Ariel. The story unfolds slowly as Seachrist transforms herself into an amateur sleuth. Along the way, Natalie encounters characters that take her into historical events of both pre-Maoist China, and of Hawaii’s history as a nation state. Familial relations are big part of Natalie’s story, as is an emerging romance with an ex-cop. Twins have "special" powers amongst each other. They can feel each others pain, sense when one is in trouble, and even communicate without speaking out loud. The twins in Prospect For Murder by Jeanne Burrows-Johnson are no different but are so different !!! In Prospect For Murder you have twins Nathan and Natalie as well as Nathan's granddaughters, Ariel and Brianna, who are also twins. Natalie also has a "gift" of seeing things happen....like before she received word that Ariel had died, she h Twins have "special" powers amongst each other. They can feel each others pain, sense when one is in trouble, and even communicate without speaking out loud. The twins in Prospect For Murder by Jeanne Burrows-Johnson are no different but are so different !!! In Prospect For Murder you have twins Nathan and Natalie as well as Nathan's granddaughters, Ariel and Brianna, who are also twins. Natalie also has a "gift" of seeing things happen....like before she received word that Ariel had died, she had seen it ALL in a vision. They know that there is no way that Ariel would have committed suicide and Natalie being the journalist that she is feels that it is up to her to find out what happened to her grand-niece. So in order for her to investigate thoroughly Natalie rents out the apartment that Ariel was looking at when she died. Review available at Foreword Reviews.